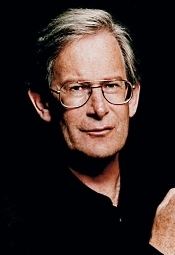 John Eliot Gardiner, Vienna Philharmonic Orchestra. DG 289 459 156 2. 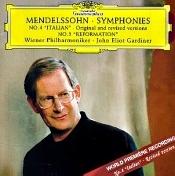 There is certainly no dearth of good Mendelssohn Fourth Symphonies around, what with Abbado (DG and Decca), Blomstedt (Decca), Klemperer (EMI), Munch (RCA and JVC), Sinopoli (DG), Previn (EMI), Bernstein (Sony), and many others. But John Eliot Gardiner's disc comes with a new twist: He gives us not only the familiar original version but the revised version as well. Apparently, German composer, pianist, conductor, and organist Felix Mendelssohn (1809-1847) was a compulsive tinkerer and reviser, saying to a friend, "In everything I have written down there is at least as much deleted as there is allowed to stand." A year or two after the premiere of his Fourth Symphony, he reworked the last three movements. He never got around to the first movement--he said he would have to redo everything about it--nor did he ever publish his revisions. In any event, in the Gardiner disc we now have both versions, and upon close inspection there is a myriad of detail changes in those last three movements, the most obvious on this recording being a clarifying of the orchestration to provide greater transparency of sound. Gardiner directs the Vienna Philharmonic with verve and bounce, reminding us of his period-instrument, historically informed background, yet he imparts a characteristic grace and smoothness, too. And, needless to say, the Vienna players respond splendidly, proving once again why the VPO is among the world's greatest orchestras. The results are infectious, and the performance deserves to stand alongside the best in the catalogue. The sound of this 1999 release, however, is another story, somewhat overwrought, too warmly reverberant to convey fully the lighter spirits of the work. In this regard, I prefer Claudio Abbado's early Decca recording best of all, especially as remastered by HDTT. In any case, those who would buy the Gardiner recording probably would do so because they like the man's work or because they want to compare Mendelssohn's two versions of the symphony. Accompanying the Fourth Symphony is Mendelssohn's Fifth, actually the second in order of composition. It is a common companion to the Fourth on disc, and one can find both of them on Abbado's DG disc at a slightly lower cost. If the sound of the Gardiner were more transparent, I would not hesitate to recommend it as a personal first choice. As it stands, it is a fine curiosity and a worthy adjunct to other favored recordings.